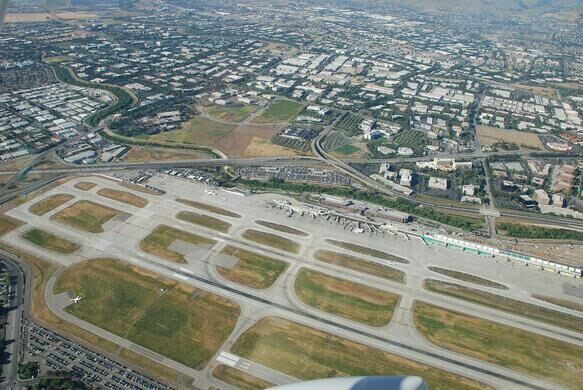 Though now an integral part of large-scale agriculture throughout the United States, honey bees were unknown on the West Coast until they arrived at Norman Y. Mineta San Jose International Airport. Well, at least what would one day become the airport. In 1853, Texan Christopher A. Shelton purchased 12 hives of bees from an unknown beekeeper in what is now Colon, Panama. The bees, already transported to Panama from New York, were then sent up to San Francisco and Alviso, the nearest port to San Jose, by steamer. They then continued their journey via train and mule to the 1939-acre Rancho Potrero de Santa Clara where Shelton settled. Only enough bees to form one hive survived. These German black bees (Apis mellifera mellifera) endured the tedious trek and were propagated throughout California and soon the whole of the West Coast. Shelton was not so fortunate and died alongside other prominent South Bay Residents of the time on the infamous Jenny Lind steamship explosion just a month after the receipt of his bees. His three hives—it didn’t take long for his original stock to multiply—were sold at auction for $110 each, 22 times the price of a beehive on the East Coast. Today, the descendants of those immigrant bees are indispensable assets for North American farmers. In the spring, honey bees are trucked into California almond orchards to pollinate the blossoming trees. They’re then packed up and shipped to Oregon and Washington, where they pollinate berry fields and fruit orchards before continuing on their nationwide circuit. 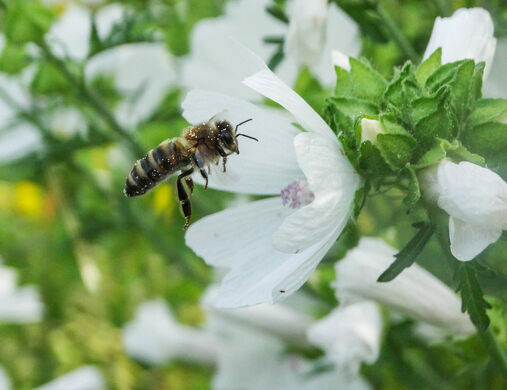 Though not native to the U.S., honey bees are absolutely essential to U.S. agriculture. Their introduction into California was key to the state’s rise as a major global agricultural producer. 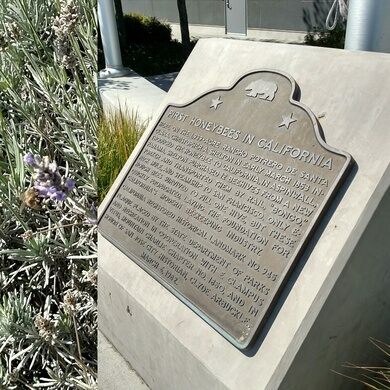 A marker commemorating the historic introduction of the honey bee sits in front of the international terminal of the San Jose Airport.